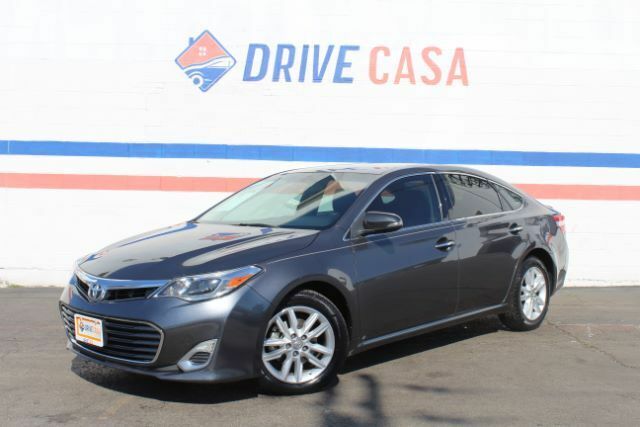 Our stunning 2014 Toyota Avalon XLE Sedan is presented in elegant Classic Silver Metallic. Powered by an athletic 3.5 Liter V6 offering 268hp while teamed with an intelligent 6 Speed Automatic transmission for amazing passing maneuvers. This Front Wheel Drive is masterfully designed and has a stellar record of reliability, responsive driving dynamics, plus the ability to show off near 31mpg. The interior of our Avalon XLE features stitched leather on heated power seats with lumbar support will cradle you and controls that are intuitively arranged will make you wonder if this interior has been specially tailored for you. Automatic headlights, heated mirrors, and dual-zone automatic climate control are thoughtful touches. You''ll appreciate the ease of use of the large central touchscreen display, Bluetooth phone/audio connectivity and an eight-speaker audio system with a CD player and iPod interface. You''ll even have a large center armrest that provides storage space and additional connectivity and charging for cell phones. Here at Drive Casa we pride ourselves on customer service and quality vehicles. As one of the premier Buy Here Pay Here dealers in Texas, we are passionate about helping people with poor credit or no credit at all get financed through our in-house program. Every vehicle comes with a 12 month/12,000 mile limited warranty. To top that, oil changes are on us for the first year of ownership! Stop by or call us today! We are here for you! Aqui en Drive Casa nos enorgullecemos de servicio al cliente y vehiculos de calidad. Como uno de los distribuidores principals de Buy Here Pay Here en Texas, nos apasiona ayudar a las personas con mal credito en lo absoluto o ser financiados a traves de nuestro programa interno. Cada vehiculo viene con una grantia limitada de 12 meses / 12,000 millas. Por encima de eso, los cambios de aceite estan a nuestro costo el primer ano de propiedad! Venga o llamenos hoy mismo! Estamos aqui para ti!